I often answer questions via email and social media from people who are struggling, and dealing with frustrating situations. The questions might be about health, relationships, money or other things, but my answer is always the same. The questions come from wonderfully unique people, but the struggles are similar and so is the answer. I can only answer based on what I believe and what I’ve experienced. Both the questions/concerns and answers below are much shorter and to the point than a conversation I might really have, because I don’t want my directness to come off as callous. I care deeply about you and want to help, and don’t want anything to get in the way of that. I am in debt and sick of never having money after I pay my bills. Spend less. I don’t know what my personal style is or what looks good on me. Wear less. My house is too big, too expensive, too much to take care of. Live in less space. I want to feel rested instead of anxious and overworked. Do less. I have health problems and feel sick and tired. Consume fewer animal products and less processed food. No one thinks I should (insert major life change here). Care less about what they think and trust yourself. I want to enjoy traveling. Pack less. I can’t convince my husband/wife/children/partner/parent to live more simply. Convince less. I hate cleaning and organizing. Live with less. I worry about my everything and I can’t sleep. Worry less. I don’t want to be so busy. Commit to less. I can’t keep up with social media and other digital distractions. Spend less time online. I want to feel more productive. Put less on your to-do list. I don’t have time to start a blog, exercise, be creative, or simplify my life. Watch less TV. I want to do better work. Do less busy work. I feel bad because everyone else is doing everything I want to do. Compare less. I want to be a minimalist. Own less. I want people to listen to me. Say less. I don’t know how to be happy. Complain less. Perhaps easier said than done, but that doesn’t change the answer. When I offer a solution, I don’t take the responsibility lightly. I explain that I can only answer from my experience and what I would do in a similar situation. I also understand that a 5 sentence email might not fully explain the gravity of the situation and so my answer might not be a perfect solution. None of the changes I’ve made when simplifying my life have been easy, but they have made everything easier. Sometimes the changes involve more than just “less” but they all start there. Less is not an overnight solution, but it is transformative, meaningful, and the answer to your question. Love, love, LOVE this! I really do believe that most things are possible when you really simplify your life. Your answers are perfect, and anyone that has been listening/reading your blog for any amount of time knows that you could never be callous. I wish everyone could read this! This is a great post and great advice. This is great advice, even if what you’re overcommitting to is a positive. I overcomitted myself to helping others in my 12 step program and I became burned out. So now I sponsor less! I only work with a few women and the quality of the time we spend together is much better! I am a second grade teacher and I have learned over the years to grade less, give less busy work, and worry less. Instead, I focus on the most important things and let the rest go. I love this way of thinking and I have to get my head around it because it is constantly telling me to do more, buy more, eat more, experience more. 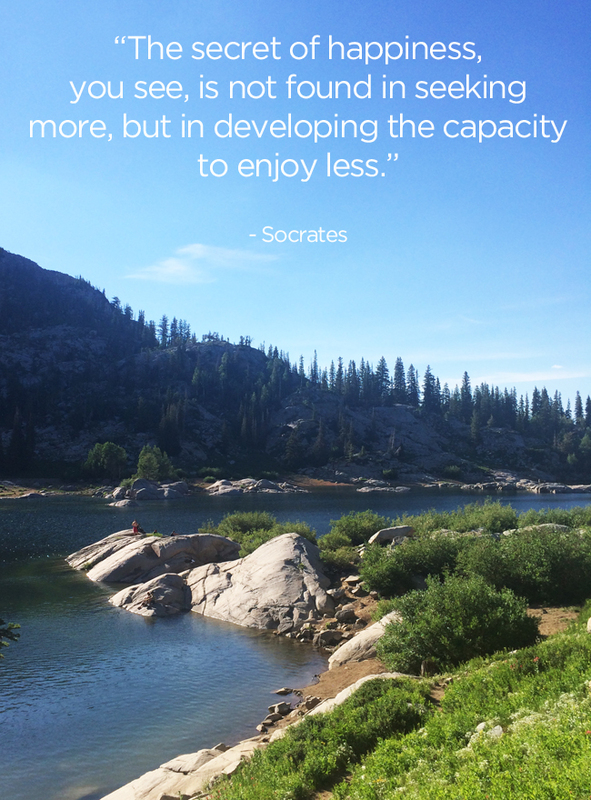 By doing less, I can enjoy more! A great paradox! Funny thing is yesterday I made a focus picture for the inside of my cupboard door. To help me focus on what is important and also to deliberately go look at when I feel a yearning for a thing that I mistakenly think will fill a hole I feel within myself. Anyway the picture starts with ‘The answer is’ and has a picture of myself feeling free, my husband loving me and my two babies smiling. The quotes I have include ‘simple’ and in the bottom section I have quotes to help when I feel stuck and one of the quotes there is ‘less’. So thank you for this. It is nice to feel like you are not alone. Best gift I ever gave myself was when I traded my To Do List for a TaDone List. Instead of spending my time worrying about all I have to do, each evening I list the things I did accomplish. So Satisfying and Soul Satisfying all around. Like the TaDone List! How many days have I said I didn’t really do anything today–except this, oh and that, and another thing, until I realized I’d actually done a lot. agreed 🙂 a very good idea for a boost. I also love the TaDone List! I always have a very long To Do list. Now I will have a TaDone list! Love this. I am working hard to live, be, do with less. I’ve said no things. I am aiming for more face to face time with people. I’ve said yes to other things. It’s a good feeling. My husband lost his job several months ago and has struggled to find a new one. As we travel this difficult journey we have also found the answer to all of our questions to be “less”. As we learn to buy less we have become quite creative. We sold our family room sofa last summer as a part of a remodel which stopped abruptly, so no new couch. After some consideration we have condensed our living & family room furniture into one room. As a result, we spend more time together as a family. This has led to us digging through more rooms, closets, and shelves and we are looking forward to selling this excess to help fund our basic expenses. And as this continues, my very hesitant husband is starting to see the joy of minimalism even during this trying time. He keeps walking into our half empty rooms and saying how much nicer it all looks. I know in time he’ll be back to work, but I know we won’t go back to buying and consuming like we did before this experience. For us it’s been a back door blessing! Congratulations on finding the positive in your negative circumstance. All the best to you and your husband. It is difficult to remember we are all worth more than our job title and the money it earns. Great story Lynn. While I’m sorry to hear about your husband’s struggle to find work, it’s great to see that you not only found the upside for now, but have really discovered some big life changes through this experience. Inspiring! I’m sure everyone that reads this finds herself saying “YES!” to one or two of the points. For me, it was the one that ended in “do less.” A fitting reminder. I’m trying! I would appreciate if you did not give out health advice. Only trained, certified medical professionals have the authority to do that. My health problems are NOT the result of having, doing, or eating too much. Health problems cause stress, so even suggesting that a sick person stress less is ignorant and insulting. It is extremely inappropriate to tell a sick person to do anything that you are not qualified to prescribe. The appropriate way to respond would be to tell the individuals that you are not qualified to respond and that they need to consult a doctor. I have found other opinions of yours to be questionable, but still gave your site a chance. After this, however, I will not be back, and I hope that other intelligent individuals will not either. CC, I think you have taken the spirit and intent of this post in the wrong way. Courtney has her own serious medical condition, in case you weren’t aware of that. She’s not trying to minimize, diagnose or treat your condition. I agree with Emily’s comment. I’m sorry you have serious health issues. It’s a known fact that many (if not most) medical professionals do not understand nutrition…strange as that may seem. Courtney’s advice to eat better foods and try to stress less is good advice for anyone. Best of luck! Thanks Kathy, I’m nodding yes to everything here. Especially about doctors not recommending good nutrition especially in MS and other autoimmune conditions. I think that is slowly changing, but I’m glad I can have conversations with people who are frustrated that their docs don’t see value. I went through the same thing and finally found a great doctor and team. When I recommend eating fewer processed foods and less stress, I don’t consider that medical advice, just common sense that we all struggle with sometimes. (at least I do). This response is not for CC, as she mentioned she won’t be back but I do take issue with a few of the statements and want to clear things up for anyone else that may be concerned. I never mentioned that having, doing, or eating too much caused health problems although, in my experience, all of those things lead to stress which exacerbates any illness. I don’t need authority to share what I’ve learned from my own battle with Multiple Sclerosis. Thankfully, I learned so much by reading other stories, and experimenting and implementing recommendations by other patients, and from people in the medical community. Health problems do cause stress, which is why I find it imperative to reduce as much stress as possible in other areas to better handle the stress that comes from being sick. That statement isn’t ignorant or insulting. It’s honest and something that’s important to think about. The world is stressful enough so when you are dealing with a chronic illness or common cold, you owe it to yourself and everyone around you to figure out how to reduce the stress where you can. As I mentioned in this post, I can only answer based on what I believe and what I’ve experienced. When responding to health questions via email, I am very clear that I’m not a doctor, and that working with a great medical team is essential. I am also very open about my journey and what works for me. It’s an appropriate, caring response. Last but not least, I want you to find my opinions questionable. That means you are thinking for yourself. We each have a personal responsibility to seek advice and answers and then to make sure what we find is a fit for us. As one person, I can’t offer a solution to every scenario in one blog post (or in a lifetime of posts) and I don’t want to. I want to offer helpful information, based on my unique life experience that will resonate with you. It won’t all resonate, but when you are ready, something will. Connecting with you and exchanging ideas is the best part of my work. I’m looking forward to more of that! I think this is my first time to respond to something on this site. However, I do feel that you are doing a very good job of sharing your journey. I have never felt that you have given medical advice. Goodness knows, when I talk to people about eating whole foods, using less meat, being careful with chemicals in their lives, etc. I don’t feel that I am giving medical advice. We are sharing from our own experiences. Thanks for all you do to encourage us on this journey to less of what we don’t need and more of what we do need in this life. Just to let you know Courtney I interpreted your ‘eat less’ for general feelings of being unwell or lack of energy not a specific medical condition. Since I have embraced less noise in my life your website is the only site I look at daily. I have tried the 333 and I loved it (until my kids started vomiting all over me and I had to start dipping into my backup- kids 🙂 ). I plan on going back to it as soon as I can. I am not religious but I appreciate the belief you have expressed as yours. Since embracing less I am more comfortable with my sense of purpose without a belief in a religion. Hi Emily, Because I have MS, I do connect with quite a few people that have been diagnosed with serious conditions. When I said “eat less” I was thinking about eating less junky food and not necessarily less overall volume. I thought I elaborated, but it might still be confusing. Either way, my recommendation based on my own experience is applicable for feeling sluggish, tired, unwell and for bigger health conditions. Love that you experimented with Project 333 and honored that you come here on a regular basis. I think your now famous (:)) ‘eat less’ comment is valid for most people. If you are giving it to people with specific health conditions or not. What I meant was that you are not advising people with those specific medical conditions to stop taking the medication prescribed to them by a doctor. Also I was saying that I find your opinions helpful, interesting and valid even though we have what can be a large difference in backgrounds with our differing religious beliefs. I found CC’s view and the way she expressed it quite narrow and negative. I have read three of your books and many posts. You always offer your opinion with a ‘it worked for me so it might work for you’. You are not pushy and you don’t conduct yourself with the arrogance other people who sell books and write popular blogs can do. I can see you put a lot of yourself into your work and I was upset on your behalf. Something I need to do less actually. Getting upset and then putting myself in the middle. Thanks Emily. I really appreciate your support. Thanks, Coutney. From my experience, (it’s been 15 yrs) simplifying life does take time and determination. My journey started with reducing debt. That took almost 6 yrs. Pauses, switching gears, and one area leading to another is part of my journey. People around you won’t always understand or be supportive, but forge the way, anyway. As for health, I discovered (after going vegetarian, that a healthy thyroid needs animal protein; I would say for everyone to check with your doctor and DO YOUR OWN research, too, when it comes to your health. Hi Cindy, I experienced those pauses and gear switching too. Luckily this isn’t a race. I completely agree with you that everyone needs to do their own research, experiment with recommendations and become their own advocate especially when it comes to health. FYI – I am a vegetarian and my thyroid is healthy. I like the “care less” and adding “worry less”. This advice is spot on! One thing I need less of is the internet. Damn you buzzfeed! I wish I knew you of your blog 3 years ago, when I was mindlessly accumulating more in my life. Your advise is on point, and cuts through the core. I find the following to be the most challenging: “I can’t convince my husband/wife/children/partner/parent to live more simply. Convince less.” Then I am reminded to: “be the change that you want to see”. Ditto! My parents are hoarders and even though they complain about having too much stuff they can’t seem to take the necessary steps to get rid of things (too many memories, these things may be useful one day etc), or stop the incoming flow (bargains from charity shops…). I get very frustrated every time I visit because I am certain (in my opinion) that they would enjoy their home more if they could declutter. As my advice and offers of help are almost always ignored I think I need to take Courtney’s advice to ‘convince less’, for my own sanity if nothing else! Thanks Courtney. Wow – so simple and so wise! I can relate to pretty much all of these issues and love how they all boil down to ‘less’. Thanks! I disagree with consuming fewer animal products & speaking less. Consume fewer Mc Donald’s hamburgers perhaps, but things like grassfed beef, wild salmon, organic eggs etc are all excellent parts of a healthy diet. And if you aren’t being heard because you’re too timid or because others are rudely ignoring you on purpose, speaking less won’t work. Truly this post speaks to me, as I have often thought this same philosophy-to have more, let’s aim for less. Less stress, less arguments, less debts, less sleepless nights dealing with worries, less IS the answer. Thank you!!!! This is a brilliant post, I wouldn’t change a thing. Thanks for all you do to inform and help us! I say YES! Less debt, stress, anxiety, business, comparing, etc. I TOTALLY love this post. Thanks for the inspiration! I LOVE this. I’m applying this all the time now. I ask myself when I don’t like or enjoy something, something stresses me out, etc….how can LESS apply to this? Thank you!! Always a reader and this one hit home for me. Hi Courtney, This is my first post on your blog. I am about a month into my minimalist journey – at least using the word minimalist. This list is great and I will refer others to it to help explain my new philosophy of life! I had been worried about friendships. A lot of our conversation revolves around what our children are doing. Since my oldest isn’t following the expectations of our church and some of my friends children are , I have felt inadequate and out of place to say the least in regards to my friends. So “hurrah for worry less”.